“With all my heart, I want to leave you with the truth.” Billy Graham brings this compelling message of hope through Jesus Christ, with chart-topping Lecrae and lead singer Lacey Sturm. Run time: 29:31. 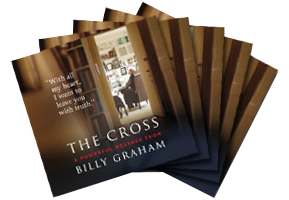 The Cross DVD includes a 2-minute trailer for My Hope and is viewable with subtitles in English, Welsh, Arabic, Chinese, Korean, Polish and Portuguese.